Home / Blog / Minneapolis: Can Mapping Assets Make a More Resilient City? The Minneapolis Health Department is one of 12 local health departments participating in a national Climate and Health Learning Collaborative for Urban Health Departments. The Collaborative is funded by the Kresge Foundation, and coordinated by the Center for Climate Change and Health at the Public Health Institute. Minneapolis is currently ranked as the second US city likely to be most significantly impacted by climate change due to the drastic increase in precipitation and extreme storms during certain months and severe drought during others. Minneapolis is also vulnerable to extreme heat and the urban heat island effect- coming in at ninth for the biggest difference between urban and rural temperatures. During the summer, it can be up to 22 degrees hotter in the city than in nearby rural areas. Fortunately, in 2012 Minneapolis City Council set bold goals for greenhouse gas emission reductions- 15% by 2015 and 30% by 2025, and updated the goal to 80% by 2050 in April 2014. Emissions declined by more than 9% between 2006 and 2013. In 2013 Minneapolis released a robust Climate Action Plan, which outlines strategies to reach their goals including energy efficiency and renewables, increase of bike lanes and active transport, increase recycling and composting, while ensuring sustainable and equitable growth. Minneapolis has been very proactive in reaching these goals and creating a more resilient and equitable city. In spring 2016, Minneapolis was selected to participate in the Rockefeller Foundation 100 Resilient Cities project to prepare the city for a changing climate while addressing increasing social and economic pressures. Minneapolis identified several sources of “shock and stress” that contribute to inequities and increased vulnerability to the impacts of climate change, including aging infrastructure, economic inequality, heat waves, lack of affordable housing, and others. The work of numerous agencies on the 100 Resilient Cities project and the health department participation in the Climate and Health Learning Collaborative have situated climate, health, and equity as top priorities for Minneapolis. 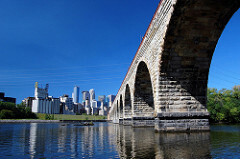 Minneapolis’s work with the Climate and Health Learning Collaborative began with a climate and health vulnerability assessment in which they assessed biophysical and social vulnerability in partnership with a team of urban planning graduate students from the University of Minnesota Humphrey School of Public Affairs. This process involved mapping factors that contribute to vulnerability, urban heat island effect, and factors that contribute to flooding. Factors that increased vulnerability to natural hazards include lack of access to a vehicle, lack of central air, limited English proficiency, and numerous others. These factors make it harder for people to avoid and recover from natural hazard such as extreme heat and flooding. The vulnerability assessment and corresponding maps allowed the health department to identify three uniquely vulnerable communities. The three neighborhoods identified were Longfellow, Near North, and Phillips; each reflects various combinations of the vulnerability factors discussed above. The health department worked with community–based organizations working in each neighborhood and Macalester College to facilitate community dialogues about vulnerability, adaptation, and resilience. In Phillips, MHD partnered with Pillsbury United Communities- Waite House, and in Longfellow they partnered with Seward Neighborhood Association and Longfellow Community Council. This partnership with CBOs allowed the health department to more effectively reach community members and encourage them to participate in a dialogue with MHD. This process also unearthed some of the challenges of community engagement and outreach. Unfortunately in the third neighborhood, Near North, staff turnover at a well-respected CBO halted the process and postponed the community dialogue for a few months. Eighteen community members attended the Phillips dialogue and the group worked to identify and map community assets in the area. The participants at the Phillips community dialogue discussed the development of greenways and bridges over the highways in order to increase connectivity and promote greening of neighborhoods. Interestingly, this also revealed concern about over-beautification of neighborhoods resulting in gentrification and displacement. Community members in both Phillips and Longfellow expressed interest in future engagement with the city, particularly around emergency preparedness and response. This motivation to engage in emergency preparedness may result in the occurrence of several Ready Camp events. The final step will be to bring the community participants together with key City staff and policy makers for a conversation about possible mitigation and adaptation steps they can make. The Minneapolis Health Department is an excellent example of commitment to meaningful community participation and flexibility in dynamic and challenging situations.